A strong core of reliable and adaptable warriors that can lay down fire while advancing or holding down terrain is an invaluable aid to any tactician. 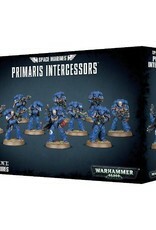 In the case of strike forces bolstered by Primaris battle-brothers, this role is fulfilled by the Intercessor Squads. Capable of levelling overlapping salvoes of firepower, these squads often form the flexible fighting core of newly-founded Primaris Chapters – though of course many established Chapters have eagerly leveraged their abilities, fielding them alongside Tactical Squads. 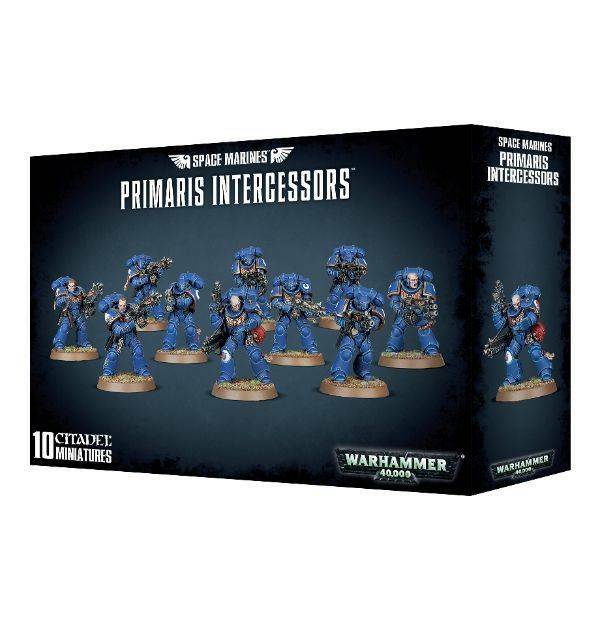 This multi-part plastic kit contains the components necessary to assemble a set of 10 Primaris Intercessors. Wearing Mk X Tacticus armour in order to take advantage of its protection and mobility, they prove to be reliable and adaptable warriors, each armed with bolt rifles. Their bolt rifles can be 1 of 3 variants – the standard bolt rifle with sickle magazine, auto bolt rifle with overcharger and box magazine, or stalker bolt rifle with longer-range sight and straight magazine. There are 16 right-hand shoulder pads decorated with the iconography of the Intercessors – enough to cover each of the variant arms, including 2 with an open radio panel, 2 gesturing for their squad to halt, 2 holding combat knives and 2 firing bolt pistols. There are a total of 36 different heads available in this kit, covering helmeted and bare options. The models can be assembled as either a 10-man squad, a squad of 9 Intercessors with a Sergeant or 2 separate 5-man squads, each with a Sergeant of their own. The Sergeants feature unique heads, with a helmet mag-locked to their belt, and unique tilting plates to help them stand out. Reflecting their battlefield versatility, the Intercessors come with lots of extra details to be added to their armour – 12 pistol holsters (2 empty, for the Intercessors actually wielding them), 10 ammunition and grenade pouches, 6 combat knife scabbards (4 empty), 4 single grenade pouches and 4 bolt pistol ammunition pouches. The Primaris Intercessors come as 266 components, and are supplied with 10 Citadel 32mm Round bases and a transfer sheet.